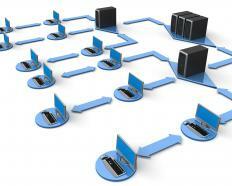 Quality of service provides better service for selected traffic types over various types of packet-switched networks. Quality of Service or QoS is a method of providing better service for selected traffic types over various types of packet-switched networks. The network medium used could be any one of several types of technology ranging from Ethernet to Wireless and Frame Relay networks. QoS provides a method for determining which traffic should be given priority on a network segment. An example of an environment that uses QoS would be an Internet based phone system on an organization’s network. Suppose an organization creates a packet-switched network with ten computers using Ethernet as the backbone. The company then connects a router and other hardware to connect to the public Internet. QoS does not really become affected by this scenario, because all of the traffic is of primarily the same type. When the company decides to attach a new telephone system to their network using Voice Over IP technology, QoS becomes a factor. The primary function of QoS is to ensure that all technologies are getting the bandwidth they need to function at a desired level. In this case, the telephones would be getting enough bandwidth to prevent choppy calls and the computers would be getting enough bandwidth to surf the Internet and perform duties to avoid seeming slow to their users. QoS employs resource reservation control mechanisms to allow administrators to set a desired level of service for each traffic type on the network. By allowing telephone traffic to have a higher QoS than Internet traffic, there will be much less interference when using the telephone because the network will anticipate telephone calls and adjust the bandwidth to all devices accordingly. Computer networking technologies must also take things like congestion into account. When two users in the above example are on the Internet and three phone calls come in, the network must be able to decide what to do with all of the traffic being thrown at it. Many times a good portion of the traffic will be handled using a technology called queuing, which allows traffic to be stored until it can be processed, depending on the method of queuing used. Think of queuing like this: suppose there are five telephone lines coming into the organization, but only two people available to answer any calls at a given time. A queuing system would receive all of the incoming calls and route two calls to the available employees, while continuing to manage the other calls. Two of the common queuing types used with QoS are First in First Out (FIFO) queuing and Priority Queuing. FIFO queuing allows the first traffic into the queue to be the first traffic out. In our telephone example, this would allow the third caller to be the next call taken even if the remaining two lines fill up. Priority queuing allows different types of traffic to be assigned priority and have bandwidth allotted to this traffic as the need increases. If telephony traffic is given a higher priority than data traffic in our organization, as employees begin to use the phone, the Internet will begin to slow down for other users. The non-telephone traffic will be restricted to allow telephone calls better quality of service. QoS and the need for technology to manage multiple traffic types on the same network are growing and will become more commonplace in the future. @miriam98 -- I worked at a telecom company and monitoring QoS was top priority for our VOIP packages. I agree that we sold these bundles mainly to businesses and let the smaller VOIP startups sell the VOIP services to the residential customers. In time, however, I think all telecom companies will be heading in this direction, for both residential and business packages. @miriam98 -- To this day, I still have not used any VOIP providers. I am originally from the Middle East. I had a guy call me once from Egypt and offer to sell me VOIP telephone service. The call quality was terrible. Apparently these VOIP startups are all over the world and their telemarketing prospects are all over the world as well, if you know what I mean. The “world is their oyster.” The problem is, most of the overseas-based VOIP QoS standards have not be up to par with the United States QoS protocols. I admit the VOIP calls in the U.S. have been much better, but I think I’ll stay this one out a few years longer. QoS is a big deal now that all telecommunications companies are jumping on the Voice Over Internet Protocol bandwagon. The start-up VOIP companies have been giving the big telecom giants a run for their money for quite some time now. Most consumers mistakenly believed, however, that it was only the smaller VOIP companies that could provide the service. However, all telecom companies can provide these VOIP services—and they are. Does that mean they’re shooting themselves in the foot? After all, how can they provide standard telephone service on the one hand, and then provide VOIP service as well? It has to do with the packages and bundles they’re offering and the QoS management. Usually the big telecom companies offer VOIP packages for businesses, to use in their internal phone systems. Since these are local systems, call quality is still good even though it’s using packets. There’s no noticeable “latency”— the lag that most people complain about with VOIP calls.